Osgood’s drinking water met or exceeded the strict standards set by the State and the U.S. Environmental Protection Agency. The Osgood Waterworks works hard to make sure the water you drink is high quality. This annual report, which covers all of 2017, describes the quality of our drinking water, where it comes from and where you can get more information. The source of Osgood water is Laughery Creek and the quarry ponds. All drinking water, including bottled water, may reasonably be expected to contain at least small amounts of some contaminants. The presence of contaminants does not necessarily indicate that water poses a health risk. More information about contaminants and potential health effects can be obtained by calling the U.S. Environmental Protection Agency’s Safe Drinking Water Hotline (1-800-426-4791). Generally, sources of drinking water include rivers, lakes, streams, natural springs and wells. As water travels over the surface of the land or under the ground, it dissolves naturally-occurring minerals and radioactive material. It also picks up substances left by animal or human activity as it travels to its destination. For instance, microbial contaminants may come from sewage treatment plants, septic tanks, livestock operations and wildlife. Pesticides and herbicides come from agricultural runoff and excess residential use. Other contaminants come from the urban runoff, petroleum products, mining and industrial wastewater. Radioactive materials can occur naturally or can come from oil and gas production and mining. The quality of Osgood’s water is governed by the Safe Drinking Water Act. The U.S. Environmental Protection Agency and the State implement this very important law. It requires all of the nation’s water suppliers to meet certain drinking water standard and to monitor the water regularly. 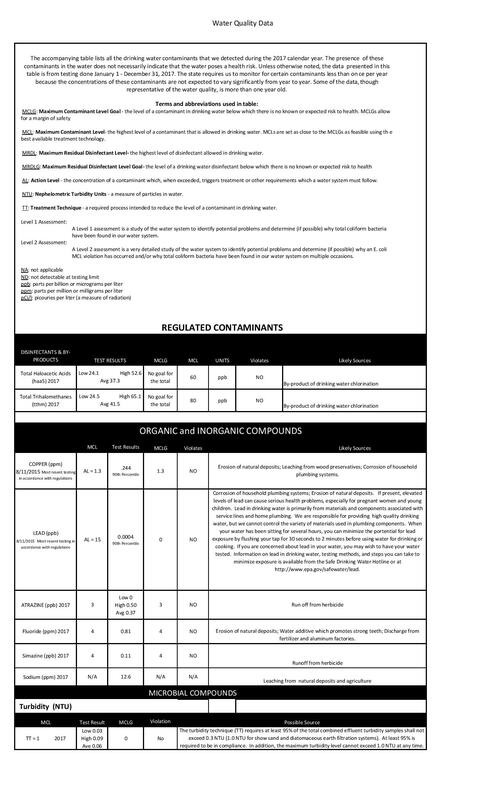 If our water ever violates one of these standards or the department ever fails to report water quality data to the state, we will alert you promptly and tell you what to do. The Safe Drinking Water Act was passed by the U.S. Congress in 1974, and it was updated as recently as 1996. Help us protect our source water. Carefully follow instructions on pesticides and herbicides you use for your lawn and garden, and properly dispose of household chemicals, paints and waste oil.